No markings other than the number 140 impressed into the back of the plate. The portrait is hand painted and it is stunning! All of the painted jewels are very slightly raised from a heavy brush with great detail. Pair of Huge Antique Staffordshire Cow with Boy Girl Figurines, c. 19th Century. This fine pair of Staffordshire pottery figurines have a boy and a girl standing with a cow at a stream. These are large and very attractive figurines with a colorful hand-painted design. These Staffordshire figurines were manufactured during the middle of the 1800's. I offer this huge pair of Staffordshire cow figurines with no reserve and a Buy It Now. Good luck! DIMENSIONS: The Boy Cow figurine is approximately 7 11/16" H. to 7 7/16" W. x 4 3/16" Deep at the base. The Girl Cow figurine is 8 3/16" H. x 7 13/16" W. x 4 3/4" Deep at the base. CONDITION: The condition is very good with some roughness and minor nicks to the base and some enamel loss. Beautiful pair of Dagoty paris porcelain french empire soup plates & dinner plate with gold ground border with urns garlands and cherubs dating to first half 19th century. 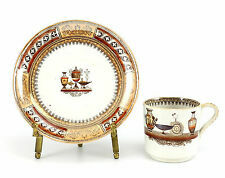 These are pieces from a dinner service popular in Paris made around the french empire period. This bowl is in very good condition. There is a rough feel to part of the top rim. The colors are bright and the gold trim is intact. Stands on 3 feet. Marked with the Maple leaf which indicates late 1800's to early 1900's. The photos are dark. this piece is stark white. It is in excellent condition. NO staining. Any crazing is at a very minimum. From a historic Tennessee estate. Lot of 8 pcs Vintage Relco Creation Gold Trim Teacups and Saucers. Includes 4 cups and 4 plates. Cup measures 2” Tall x 3” diameter (excluding handle) Saucer measures 4.5” in diameter No chips or cracks. Nice antique set of Staffordshire spaniels. Russet and white coloration with applied gilding on the chain. Open front legs, these dogs stand 5.5" tall. Beautiful painting and sweet faces. Would be a lovely addition to a Staffordshire collection. RARE teacup & saucer with BUTTERFLIES. Asian Mark on the base of the saucer. Yellow Petals with red stripes cover the entire cup and saucer, inside and out. Translucent when held to the light, especially the cup. Based on the mark, it was made in 1914. The front and back depict red and pink roses, while the side panels continue the picture from the front panels. The bowl in in shape F132. The bowl is in excellent condition. Though unmarked, this is likely German in origin and brings to mind the work of the early Goebel factory. The little formally attired gent sits in a decidedly casual pose, with his legs stretched out before him. 9 x 6 x 5 1/2-inch Wedgwood 3 piece oval Caneware game pie dish with hare on top and crimped pie edge. The relief design features a variety of game animals and foliage. Signed on the base with impressed Wedgwood and letter date V indicating mid 1860s age. The insert has a chip on the outer rim. Please see photos. It is marked on the bottomHand Painted Nippon with the green maple leaf. The hand painted roses are beautiful and very well done right down to the elaborate hand painted gold swirls that line the entire top inside rim of the bowl. This is a lovely piece of early 19th century Chinese Canton Export Porcelain in a nice large size. VINTAGE, Man and Boy PORCELAIN FIGURING, MADE IN JAPAN. Shipped with USPS Priority Mail. English ironstone china dish. white ironstone cake pedestal. It's a hefty platter showing. Think this will look marvelous. good luck or a buy-it-now. that sold earlier back in April. Surplus NOS Kentile. There is plenty of info on Inspectipedia's site about how to safely handle this tile. Veined Beige/Brown Vinyl Asbestos Floor Tile. All original. I love the great vibrant colors on the tile. Just a very nice Victorian piece to add to your collection. On the back shows the blue double crossed swords under-glaze mark. Possibly Schierholz. 13" Long x 10.75" Wide x 4 1/8" High. French Ladies Oyster Plate by C.F. Haviland Limoges GDM Excellent Condition. Excellent vintage condition..No chips, cracks or crazing...does not appear to have been used. Antique Teacup and Saucer. Made in Bavaria. White and Gold Porcelain. Pair of Antique Leeds Type Five-Color Floral Handpainted Pearlware Plates, c. 1800. This is a very pretty pair of pearlware plates with a five-color handpainted pink floral design and scalloped rims. Many dealers and collectors might call these Leeds plates. But these are unmarked so they could have been made by many different English maker's. These are very early examples made of pearlware and both in very good condition. This is a very pretty pair of pearlware plates offered here with no reserve and a Buy It Now. DIMENSIONS: The floral handpainted pearlware plates are 7/8" H. x 7 3/4" Dia.. CONDITION: The condition is very good with a small chip to the foot rim. SHIPPING: Buyer pays actual shipping costs based upon the 3 pounds and 15 ounces weight and postal zone. WE DO NOT PUT LOWER VALUES ON CUSTOM FORMS. WE SPECIALIZE IN LIQUIDATING LARGE COLLECTIONS! 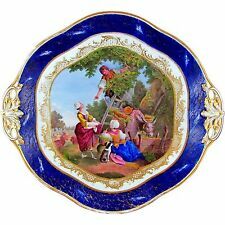 Antique porcelain candy dish made by Maison of France. Mint condition with gold handle and edge trim. The makers mark on the bottom dates this to 1911-1920 according to my research. Maison Prevel Maison Metz, with a star. There is also a gold fingerprint next to the makers mark, which makes this unique in my opinion. Possibly the artists fingerprint? It measures 10 inches long by 7 inches wide. The only mark we see is the number 33 on the bottom. Nice clean condition. 8 1/4" high. From a local estate. Gorgeous Royal Stafford Teacup and Saucer. Robin Egg Light Blue background, it is adorned by a. large Cabbage Rose and English flower garden. Franz Porcelain Flower Tea Cup and Saucer FZ00456 . Shipped with USPS Priority Mail. Pre-Owned. No chips or cracking. Missing a skid dot on bottom. Smoke and pet free home. New ListingEarly Miniature Antique Yelloware Bowl!! 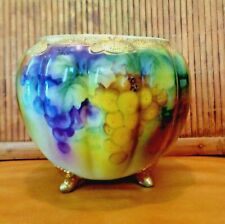 Early Miniature Antique Yelloware Bowl!!. Shipped with USPS Priority Mail.This is a beautiful survivor,It does have brown spots on one side and the bottom that seem to be under the glaze.This bowl is only 2" tall and 4 1/4" across.It has a hairline on the inside.Please no international bidders.Thanks for looking and good luck! It is decorated with floral pattern and gold trim. It's pre-owned but in very good condition. for any reason?. There are a few very small flakes on the back foot rim that are certainly as made and also, an in the making kiln kiss on the top outer edge, otherwise fine. This Cremation Urn features a glossy and shiny purple finish with a brushed pewter band near the cap and gorgeous flying butterflies. The Purple color of the Embrace symbolises peace, luxury, nobility & devotion and is a perfect resting place for a loved one with similar tastes and personality. New ListingRoyal Doulton Bone China Lucy Anne Figurine HN 1502 Retired 1951 England 5.5"
Royal Doulton Bone China Lucy Anne Figurine HN 1502 Retired 1951 England 5.5". Mint condition. Shipped with USPS Priority Mail. Antique POONAH PLATE By Bates Gildea & Walker Birds, Landscape, Scroll NUMBERED. I believe these are from sometime between 1878-1882 The marking 1790 on the back of the plate refers to the date the company or works were first built by Joseph Stubbs, who was a successful earthenware manufacturer during 1822- 5 period. He was later succeeded in 1843 by Thomas, John and Joshua Mayer. The wording LATE MAYER on the back of the plate refers to these men. Very good condition. No chips or cracks. There is crazing Please message me with any questions Shipped with USPS Priority Mail. GEORGE JONES, ENGLAND CIRCA 1930'S. HISTORIC BLUE, TRANSFERWARE. Here with a horn and he with a mandolin. We did not find a makers mark. There are two incised lines below the rim. The base itself is shaped and extends outwards. The bowl is glazed inside and out, but not on the bottom of the base. The glaze is two tone salmon in color with darker brown splotches dispersed within the lighter salmon colored background. Marked France on the base. The Sevres mark is on the bronze base. Gilding with a pretty woman depicted. Very nice shape. No Reserve. New Listing3 Alletons Made in England light blue and white transferware small bowls 5 1/2"
We have these beautiful Dessert Bowls 5 1/2", super nice blue and white transferware, looking WITH trees Orenital house church, etc china design bowls. This listing is for a very nice set of turtle soup bowls made by Bodley. The interiors with a molded turtle shell pattern and raised legs and head on the done in brown and gilt on a cream rim. They each measure just about 8" in diameter and have two different Bodley marks on the reverse. Overall condition of the set is very good. There are two bowls with a chip on the foot which are pictured. One bowl with some crazing to the glaze on the reverse. ANTIQUE TIRSCHENREUTH PORCELAIN BOWL. GOLD RIM, COBALT BLUE BORDER WITH GOLD ACCENTS. RUBBED AT THE RIM, NOTE ON BOTTOM SAYS MOLDS DESTROYED. ROSES/FLOWERS HAND PAINTED AND SIGNED. 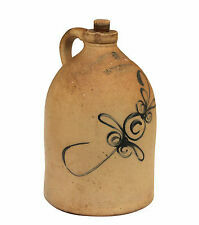 Some of the most beautiful objects you can have for your home are antique ceramics and porcelain. Long ago, someone learned that clay fired at high temperatures could be turned into something not only useful but pleasing to the eye. Affordable antique ceramics and porcelain are available on eBay. Stoneware. Like porcelain, stoneware is fired at high temperatures, which vitrifies it. It is one of the oldest types of ceramic. Ironstone. This is a type of stoneware, first manufactured in England. It is mass produced and made to bear up under daily use. Bone china. This type of very fine ceramic is actually made with bone ash. Transferware. These type of ceramics often have scenes that weren't hand painted but printed on the item. The first ink was cobalt blue, but as the technique improved, inks of red, green, brown, purple, and yellow were used. What is a Ming vase? A Ming is a vase made during the Chinese Ming dynasty, which lasted from 1368 to 1643, or a vase made in that style. Because the dynasty lasted as long as it did, the vases from different periods have different styles. A vase from the period ruled by Emperor Wan Li can have a mei ping shape and be covered with blue and white decorations. A mei ping-shaped vase has a narrow mouth, a wide, round center, and a narrow pedestal. It is made to hold one flower. How can you identify antique pottery? One way to identify ceramics is to look for marks somewhere on the piece. These marks tell you who made the piece. For example, the basic mark on a piece of Wedgwood porcelain is an amphora with the name Wedgwood beneath it. "England" was added in 1891, and "Made in England" was added beginning in 1910. However, if you're not sure, you can take your antique to an appraiser. What type of antique ceramics are available on eBay? Type: Ceramics include options like cups and saucers and figurines. Cups and saucers are often made of fine porcelain or bone china, they are exquisitely decorated, and some have gold trim or accents. Ceramic figurines can be animals, children, shepherds and shepherdesses, or abstract figures. Additional types that eBay offers are plates, vases, pitchers, bowls, tea sets, crocks, and decorative tile. Age: You can select your ceramic or porcelain by its age. Choices are pre-1800, 1800-1849, 1850-1899, 1900-1940, and post-1940. Price: If you're on a budget, eBay offers inexpensive ceramics. If you're looking for rare, antique pieces, these will often be much pricier.